Trade war stocks have varied across industries. As the China-U.S. trade war intensified, the attention fell on four sectors: semiconductors, autos, aerospace, and grains. Stocks such as Micron (NASDAQ:MU), Ford (NYSE:F), Boeing (NYSE:BA), and Archer-Daniels-Midland (NYSE:ADM) suffered as China had become a significant source of revenue. However, trade wars often lead to higher prices and job cuts as the price of goods increases. This means virtually all Americans will feel the effects of import duties even if they do not own trade war stocks themselves. Wall Street tends to ignore equities such as Dollar Tree (NASDAQ:DLTR) when talking about trade war stocks. Most of the focus within retail tends to settle on Walmart (NYSE:WMT) and other large retailers, especially when they develop a reputation for relying on imported goods. Walmart can raise prices if it must. Dollar Tree commits itself to sell its products at $1 price point or less. This makes it more difficult to find items that people want to buy and which can sell profitably for $1. It also means that some popular items could become unavailable (instead of merely more expensive) as the cost of goods sold rises. This has become even more critical to DLTR as they shutter stores in the Family Dollar division which sell products for more than $1. Dollar Tree management explicitly cited tariffs as a reason for these closures. USA Today reported that Dollar Tree imports about 42% of its goods, while Family Dollar brings in around 23% of its goods from overseas. Moreover, Dollar Tree sustained losses over the last year that its closest peer Dollar General (NYSE:DG) did not. Still, DLTR stock trades at about 16.5 times forward earnings. DG stock has a forward P/E ratio of about 17.8. For now, Wall Street forecasts a 31.7% predicted profit increase for DG vs. -0.2% for DLTR stock. However, an end to the trade war should bring higher-quality goods — and higher profits– to Dollar Tree. For next year, analysts expect an earnings increase of 13.8% for DLTR, slightly exceeding that of Dollar General. This along with plans to revitalize Family Dollar should bring bargain hunters back to DLTR stock. The industry which Cheniere (NYSEAMERICAN:LNG) pioneered ensures its rapid growth. Thanks to the Cheniere’s export terminals, exporters can now transport liquefied natural gas (LNG) across oceans, something that was not possible in previous decades. The U.S. produces more natural gas than any other country. Also, natural gas sells for around $2.90 per 1000 BTUs in the U.S. compared with about $5.60 per 1000 BTUs in China. Although it fetches more in Europe and Japan, China’s 1.386 billion population still makes it an important market. Cheniere already operates a terminal in Sabine Pass, Louisiana. Recently, the government also gave approval to Cheniere to begin operations at its Corpus Christi, Texas terminal. With two-thirds of the country’s available export capacity, Cheniere will dominate this industry for the foreseeable future. This dominance will bolster profits of LNG stock. Wall Street forecasts 32.1% increases in profit this year and 27.9% the next. Given that growth potential, the forward P/E of 20.7 appears reasonable. Admittedly, the potential business from Europe and Japan alone almost ensures the success of LNG stock. However, if it can also fuel the growth of the emerging Asian markets, particularly China, that could make LNG one of the more critical trade war stocks. 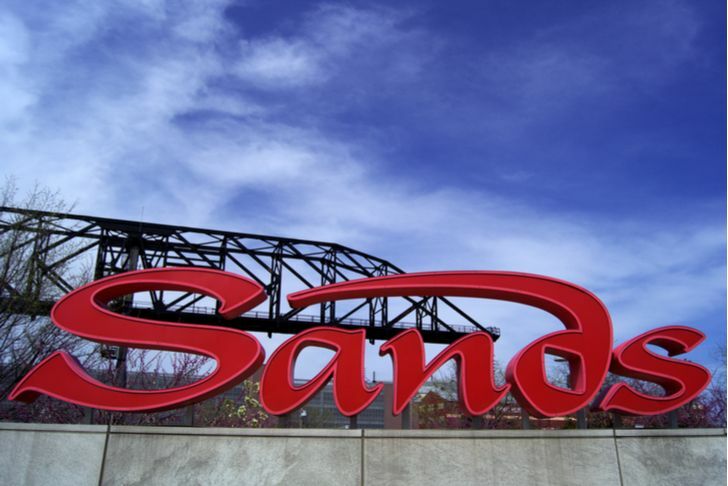 Despite the company’s name, Las Vegas Sands (NYSE:LVS) joins the list of trade war stocks by virtue of its holdings. Six of the 12 properties owned by the company are located in the Chinese gambling mecca of Macau. This compares to only four properties in its hometown of Las Vegas. With a casino in Singapore and attempts to move into the Japanese market, LVS sees Asia as its future. Furthermore, Macau’s casinos may have more of a perception problem than an actual slowdown. Gambling revenue did not stop increasing in 2018, but a slowdown in growth did occur after the trade war began. Nonetheless, LVS stock declined by more than 25% as the tariffs and a generalized decline in Chinese equities weighed on the stock. Profits for the company fell by 1.8%. The declining health of its founder and current chairman Sheldon Adelson has also brought added uncertainty to LVS. However, analysts see improvement as they expect profits to rebound to a predicted 8% increase this year. Moreover, the declines have taken its forward P/E ratio to 17.1, slightly below company averages. The lower price has also boosted the dividend yield for new buyers. Current shareholders will receive $3.08 per share in dividends this year. This brings the yield to about 5.1%. Furthermore, since the dividend has increased for six straight years, annual increases will more than likely continue. Given a China gambling market that remains robust amid tariffs, an end to a trade war should bring more gamblers and ultimately, more winnings to holders of LVS stock. Admittedly, VanEck Vectors Steel ETF (NYSEARCA:SLX) sounds like a strange choice. After all, the Trump Administration imposed tariffs on Chinese goods in large part because China had dumped cheap steel on the market. This hurt U.S. Steel (NYSE:X) and Nucor (NYSE:NUE). However, in the year since the tariffs took effect, both U.S. Steel and Nucor have hired workers and restarted steel mills. Despite these signs of improvement, the dirty secret about the steel tariffs is that industries which use steel contribute more to the economy than steel producers. Hence, the industry can sell more steel if companies such as Ford build more cars. Investors should look more closely at the behavior of these actual stocks. SLX stock dropped over the last 12 months. However, even more shockingly, X stock and NUE stock, which logically should have increased due to the tariffs, also dropped in value. The ETF holds both X and NUE stock, though Rio Tinto (NYSE:RIO) and Vale (NYSE:VALE) remain the fund’s largest holdings. The one trade-war-related benefit derives for SLX comes from dividends. In 2017, before the trade war began, SLX stock paid almost $1.12 per share in dividends. Payout levels in 2018 rose to just over $2.18 per share. A trade agreement could send that falling back. However, what shareholders may lose in lower dividends they should earn back in gains. Since tariffs began, SLX has fallen by more than $13.50 per share, a loss of about 26% of its value. An agreement will likely reverse the drop in SLX’s core holdings, and by extension, in SLX stock. The post 4 Unexpected Trade War Stocks That Will Benefit From an End to Tariffs appeared first on InvestorPlace.